Kim Kardashian’s hard work has paid off. The ubiquitous reality star posted a Snapchat on Monday, August 8, revealing she’s lost nearly 60 pounds since welcoming her second child, son Saint West. 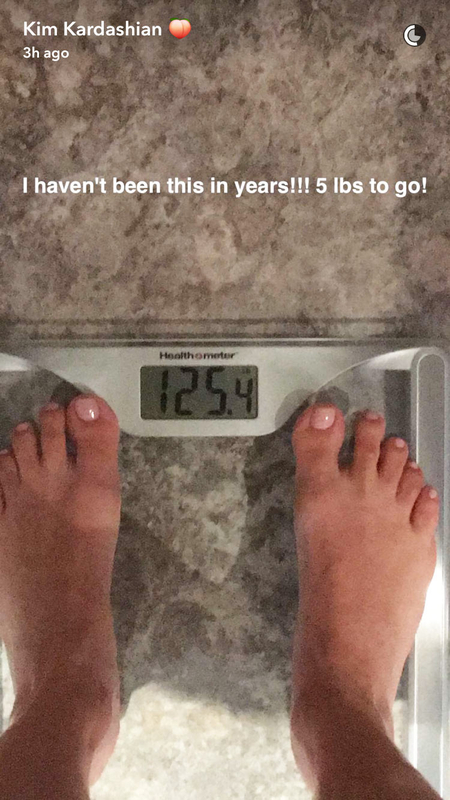 The 35-year-old mom of two shared a photo of her scale that read she&apos;s down to 125.4 pounds. “I haven’t been this in years!!! 5 lbs to go!” she wrote alongside the image. The social media maven has been on a mission to lose weight ever since she gave birth to Saint this past December. In a candid blog post on her website on Monday, Kardashian revealed how she overcame her post-pregnancy body insecurities. It tok her “a good six or seven months” to get back to her pre-baby state, she wrote, and after she welcomed Saint, she “decided to set goals” for herself. The Selfish author credits working out with a trainer and sticking to the Atkins diet for her weight loss, but she also leans on her man, Kanye West, for support. “A big source of my confidence is my husband. I&apos;m my own biggest critic. … He always encourages me, and makes me feel confident about owning all my curves and showing them off,” she wrote, adding that she also wants to have positive body image for the sake of her little girl, 3.